Are you wondering if the new no-bake clays could be a good alternative to oven-baked clay? Are you struggling with switching from polymer clay to air dry clay? Polymer clay and air dry clay each have their own set of pros and cons. The idea behind “TOP 10 REASONS WHY AIR DRY CLAY IS BETTER THAN POLYMER CLAY” is to debate the similarities and differences between polymer clay and air-dry clay. Neither modeling compound is actually “BETTER” than the other. It’s all a personal preference. It does take a bit of experimenting to find the brand of no-bake clay that suits you and your sculpting style the best, but we’re going to help you narrow down the choices before you shop! When you read this book you’ll discover the good points and bad points of the most popular brands of no-bake clay plus some tips and tricks to use with the self-hardening, air dry clays. This is not a how-to book with step-by-projects. It’s a handbook providing potential solutions for those who’ve tried air-dry clay with little success. You may come across some compelling reasons to give air dry clay another try! Don't hesitate! 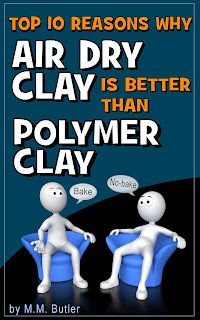 “TOP 10 REASONS WHY AIR DRY CLAY IS BETTER THAN POLYMER CLAY” will only be free until March 22nd. It's a Kindle ebook but you don't need a Kindle to read it. There's a free Kindle app at Amazon. With the app you can read any Kindle book on your computer, or on a tablet, or on a cell phone. Thank you, I just downloaded your book to my phone and can't wait to start reading it. I'm new to this medium and I am excited about trying it. Thanks again for your generosity!